An example of an Adams Rite paddle handle for use with Adams Rite latch lock. 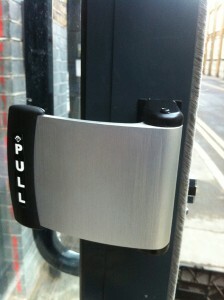 Recently installed by Alexandra Locksmiths to an office in Finchley, North London, N12. We provide Locksmith and security services, bar gates and collapsible grilles, intercom systems and safes to London and the surrounding areas.